Discover Parc d'Isle and its animal park, located just 0.6 miles (1 km) away. Our location between the Splendid events center and the Palais des Sports is perfect if you're here for cultural or sporting events. We had the best stay we have had in any IBIS. St Quentin Basilique staff were all welcoming and very helpful. I booked over the phone and the receptionist was lovely. We had two rooms, one for a disabled traveller. The rooms were spotlessly clean and stocked correctly. Breakfast was the usual IBIS tasty buffet, but rendered even more enjoyable because the staff were not hovering to hurry us up; nor did they rush to clear away the buffet before we had finished. Thank you to all theprofessional, polite, gracious equipe of IBIS St Quentin Basilique, for giving us the perfect start to our holiday- we will return soon for a longer stay. Everything went well, from the very friendly welcome to the cleanliness of the room and facilities and the good range of choice for the breakfast. Great Service, Rooms, Location & View. Fantastic hotel. Big floor to ceiling windows looking over to the Cathedral in our room. Steps from the town square and car park opposite. Most convenient & excellent value. L'Editto is a favourite restaurant of mine. We arrived on the afternoon of the 15th March and the male receptionist on duty was exceptional in changing the rooms from what we had been given to providing what we had requested. We had to stay over as we were driving back to the UK with pet cat. The hotel was excellent, the parking was perfect, the view from the room was excellent, and the rooms were large and confortable, and all this at a very reasonable rate. I was very concerned that, as I was travelling with my cat, that any problems might cause her additional anxiety, but the hotel was extremely easy to find from the motorway, checking in was very easy, and everything was simply just perfect. If I was travelling to this region again, I would certainly stay here again. Easy check in. Friendly staff. Room too hot. Good location, small breakfast and rather cold staff. Nice clean rooms with friendly staff. Comfortable rooms, friendly staff and an excellent breakfast. Good location for looking around the town and for eating dinner in local restaurants. Enjoyable three night stay at the above hotel. Main purpose of visit was the annual Marche de Noel. Unfortunately the market seems to shrink each year, and gets less and less enjoyable - we will probably give it a miss in future. As always the hotel was warm and welcoming and the staff very friendly and helpful. The breakfast buffet was being continually topped up with fresh supplies by a very concientious young man, this is something which is often ignored at other hotels in the group. Very comfortable and clean. A great stopover for us. Good breakfast. Perhaps better towels would be an improvement. We stayed for two nights when attending commemoration events nearby. We asked for a quiet room and our expectations were met. No tea, coffee or hairdryers in room but easily accesses in lobby. iron and board also readily available. Very helpful and friendly staff. 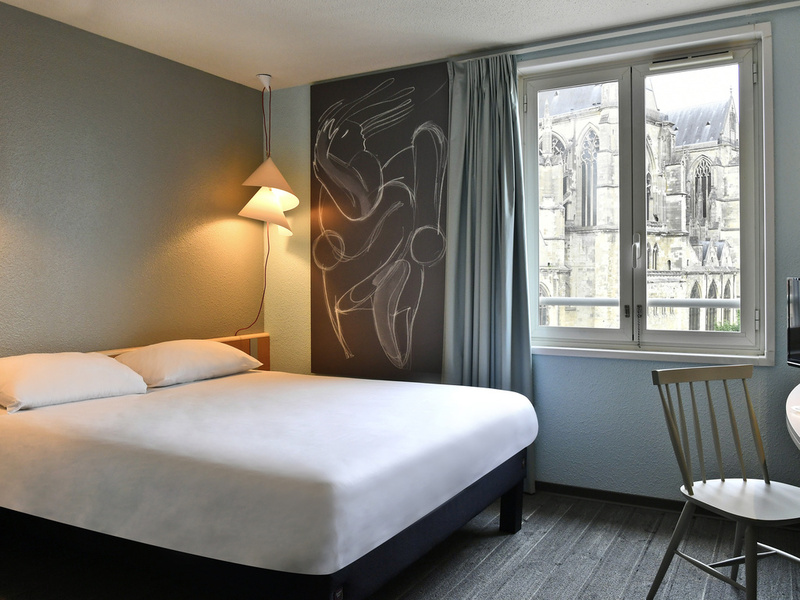 The IBIS St Quentin is located in the centre of town amongst the restaurants and shops. Rooms are reasonable size and very clean, staff are friendly and efficient. Rooms would benefit from a safe. Hotel very easy to find in a great location.